Show off your social skills with this 4 pack of the Tumblr Queen set of buttons. Features an alien, re-blog symbol, screamer and stress kitty buttons. 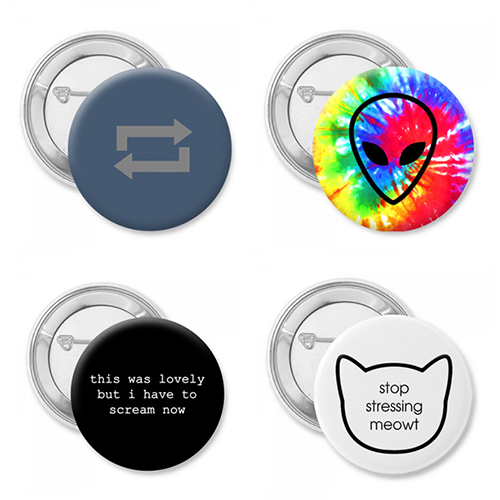 This 4 pack of buttons feature one of each: Re-blog symbol, alien, I have to Scream now and Stop Stressing meowt Kitty. Your social media skills will surely be recognized with this Tumblr Queen button pack. Great for pinning to your pack back, ball cap or jacket. You are popular so trend a little more. Choose from 3 different sizes.